I am pretty excited to be linking back in with Viridian's Sunday Stamps this week, where the theme is all about geology, rocks and the environment. I am excited because I get to share this very cool first day cover I found at a market the other week, when I took a day trip out of the city with two of my sisters. We visited the Mill Markets, a massive vintage/retro-goods market in Daylesford, about an hour out of Melbourne. 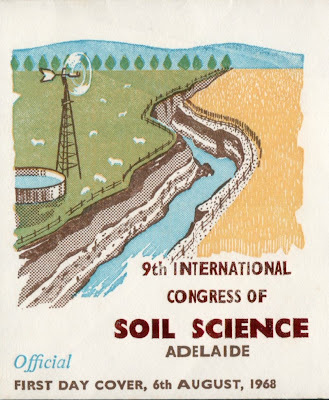 I was pretty wrapped with this First Day Cover, the 9th International Congress of Soil Science from 1968. It is not entirely geological - but definitely related, I would say. 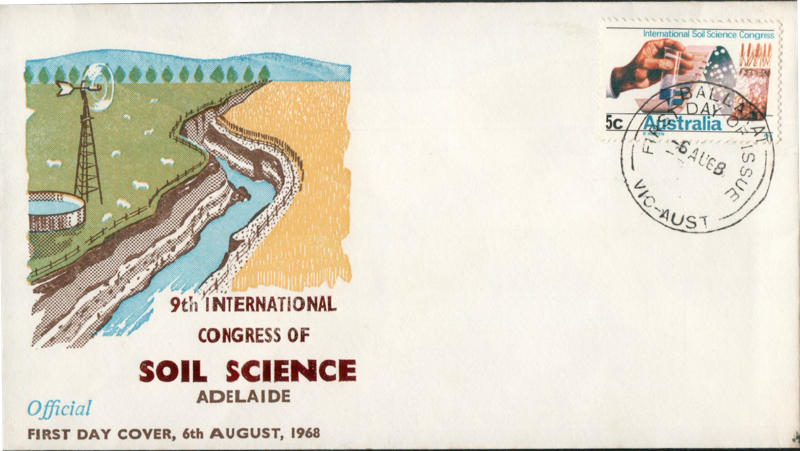 I loved the stamp and the cover instantly, because working with archaeologists makes one rather enamoured with soils, strangely enough. The type on the cover is red foil embossed, so it is all pretty spiffy, what with the nice type and little rural scene. I had not seen the cover before, so I am pretty happy to add it to my collection. 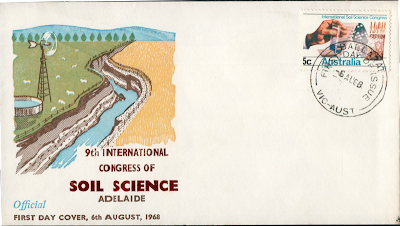 However, I already had the stamp in my collection. 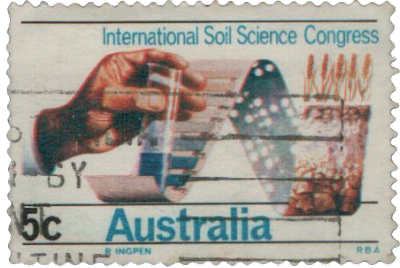 I do like the "science-y" imagery of the stamp. It has a pair, issued for the World Medical Association Assembly. 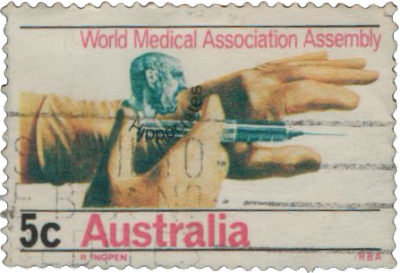 Not as nice as the soil stamp, but still pretty cool, it features Hippocrates floating above a syringe. I am glad the designer chose to also write the name of the greek head somewhat randomly perched on the syringe, because otherwise I would have been a bit puzzled. 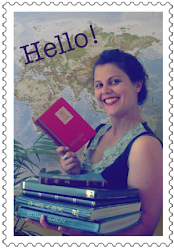 Following on from the above, I thought I would include one last stamp today. I think it fits quite nicely, both visually with the hands, and thematically with the science. It was released eight years after the soil stamp, in 1976. It celebrates 50 years of the CSIRO - the Commonwealth Scientific and Industrial Research Organisation - which is Australia's national science agency. 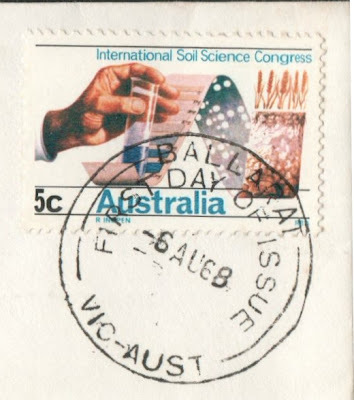 I love the CSIRO stamp. I love the CSIRO. I love the stamp for featuring graph paper and a scale bar. Awesome. I hadn't seen any of these before, it's great to see what everyone finds for the themes and what people think of. Your trip to the market sounds a good day out. and I see that it was designed by Robert Ingpen! he is a favourite of mine. I haven't seen any of his stamps before, but I have several of illustrated books. I particularly love the FDC ~~~~ Its so amazing!